Getting Chilly Quickly 2…. Early hypothermia for ROSC? By now, we all are thoroughly convinced as to the benefit of therapeutic hypothermia after cardiac arrest. (if you don’t do this in your hospital, you really should not be seeing OOHCA patients….). In addition, the consensus seems to be that time does matter and we should be doing this ASAP after ROSC. The evidence isn’t conclusive I’ll grant you (as Simon discussed in his post). Our beloved National Institute for Clinical Excellence says we should be cooling “as soon as possible after the cardiac arrest“. Can’t we be cooling the patient down during CPR? This intuitively seems like a good idea. 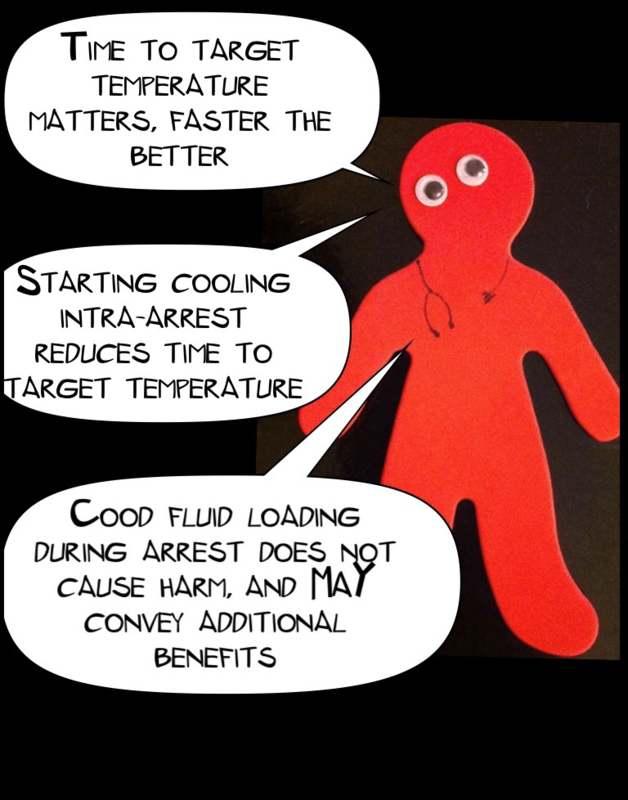 If we start during arrest, we get patients to target temperature faster. There is also a physiological rationale: one of the theoretical mechanisms for TH is the attenuation of reperfusion injury. Surely getting the patient cold before reperfusion occurs has to be good thing, right? Is intra-arrest hypothermia (IAH) better than traditional post-arrest therapeutic hypothermia (PATH). Does it increase our rates of ROSC, of survival and most importantly, the number of patients who can walk out of hospital and lead a normal life? The Rhinochill (TM) cooling backpack. If you are a similar age to me then you will inevitably be reminded of Ghostbusters…. The evidence is scarce. There is one RCT in humans out there. These guys took about 200 OOHCA patient (witnessed, all rhythms). In addition to standard ALS, they began cooling down their treatment group using a intranasal device. So did it help? Well, as a feasibility study it was successful. The patients got to target temp sooner, and the process appeared safe, However it did not detect any change in outcomes, as it was not powered to do so. Interesting, but not really relevant to our question. I imagine most ED’s will be using ice and cold fluids (and maybe a cooling blanket) to start hypothermia, so studies looking at intranasal coolant administration (or cold liquid ventilation (!)) are not that relevant to us. So that’s it for human RCTs. There are some animal studies which may be of interest to us. This study, found dramatically better outcomes when cooling (via cold fluid loading and then intravascular device) 10min post arrest than 20min post arrest. This one found IAH with an intravascular device improved outcomes in pigs. IAH with cold fluid loading did not affect any useful outcomes. So where to go now? Thinking through it, a thought occurs. Realistically, any IAH taking place in the ED will be via cold fluid loading, yes? In my practice, and I suspect in most of yours, patients are already getting 1-2 litres of crystalloid during an arrest anyway. Are we causing any harm by getting these fluids out of the fridge rather than the cupboard? If we aren’t causing harm, then reducing the time to target temperature seems a good enough reason to start cooling intra arrest. Garret et al performed a retrospective analysis comparing IAH with PATH. They found that 2000mls of cold saline started ASAP during CPR improved rates of prehospital ROSC. There was a trend towards better outcomes, but no significant improvement. So I’m going to fall off the fence, and say that I think we should be doing this. The evidence isn’t great I grant you, but I think there is enough to change practice. Hopefully I am being controversial enough to provoke a debate. Anyone disagree and think I’m over reaching? Have I missed any important evidence? Comment below, abuse me on Twitter, join me in the FOAM! P.S – no conflicts of interest to declare, (apart from being impatient). I mention the Rhinochill (TM) system, but have absolutely no involvement with the device or the manufacturer. In a galaxy far far away they have developed the concept further…. Pre-arrest hypothermia! Hi Gareth, this is another superb post. You are quickly becoming the St. Emlyn’s Cardiac Arrest guru, after your brilliant post on capnography in cardiac arrest. (If you haven’t read it yet, check it out… http://www.stemlynsblog.org/2012/10/als-airway-breathing-c02/). Inducing therapeutic hypothermia even before ROSC is going to be quite a controversial issue, especially as we only have animal evidence to back it! The RCTs that showed benefits of therapeutic hypothermia allowed a number of hours to achieve hypothermia, so there was no rush – but they still showed benefit. There isn’t any evidence of harm by inducing therapeutic hypothermia before ROSC but we should be a little bit careful – absence of evidence doesn’t equal evidence of absence. And there is some potential for hypothermia to cause harm before ROSC – it may be arrhythmogenic or make VF harder to defibrillate. What’s more, it may promote coagulopathy, which might be important in patients with hypovolaemic cardiac arrest or trauma. It could also be important in patients who end up achieving ROSC and going to the Cath Lab for primary PCI. Will the bleeding risks increase? If patients sustain a retroperitoneal haemorrhage complicating PCI, will it be more serious if the patient is hypothermic? 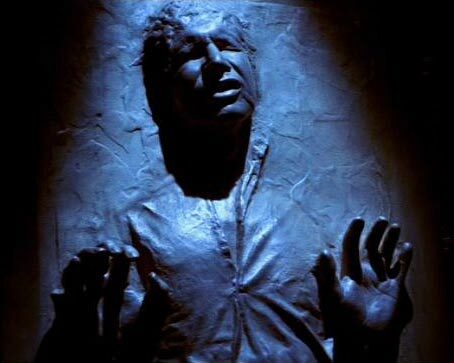 I think the jury’s still out for therapeutic hypothermia prior to ROSC, and I wouldn’t use it. But it will be interesting to see if more evidence emerges in the near future. It’s a superb blog post – it will really capture peoples’ imagination and ought to get us talking! Thanks for the comments Rick, I was hoping we’d get a good discussion going on this. I totally agree that the evidence is lacking, and mostly animal studies at that. This is the case both for the urgency of hypothermia, and for starting it pre-ROSC. Since the basis of my conclusion is ‘absence of harm’ I feel the need to address the points you’ve made. Coagulopathy is a concern. I am not advocating cooling post traumatic cardiac arrest (yet…) but I am all for cooling and PCI happening at the same time. The literature suggests it is safe, and the American ALS guidelines advocate it (http://circ.ahajournals.org/content/122/18_suppl_3/S768.full). I am told that a certain seaside PCI centre close to Virchester is doing PCI and cooling simultaneously, but don’t quote me on this. Convincing you yet? Anyone else care to weigh in? Following an interesting back and forth on twitter (thanks to @VPIMedic, @EMIMDoc and @emcrit) I have discovered that intra-arrest hypothermia isn’t as ‘out there’ as I thought… Turns out that the paramedics over in New York City have been doing it for a while now. ( http://www.emsworld.com/article/10686328/a-quicker-kind-of-cool ) Initial results from the protocol seem promising. No data published as of yet but I’m told should be happening soon. Exciting stuff! Any UK ambulance services carrying cold fluids? Anyone know? Paramedics in Victoria, Australia have been cooling post ROSC patients pre-hospitally for several years and there is currently a prospective, randomised trial in progress looking at intra-arrest hypothermia. What’s the name of the study? RINSE (Rapid Infusion of cold Normal Saline) and it’s being trialled in Victoria, South Australia and Western Australia. Inclusion/ Exclusion Criteria. Paramedics will screen the patient during cardiac arrest and determine the eligibility for enrolment. • hypothermic (tympanic temperature <34.5oC). Looking through the protocol and it looks really interesting. 2512 patients to be in the study with a planned completion date of mid 2013 so we should have an answer fairly soon. Great to see the research coming, but also interesting to see that some services are doing this already. I guess that reflects the dilemma when looking at topics like this. What do you do when evidence is pending but it seems like a good idea? Really looking forward to the data arriving in print (or better on social media) soon.